Active (CD5): For 2 rounds, convert 3 random runes to Enchanted Fire runes; Fire runes touched while spinning become Beast runes. First life: Skill 2970. 50 Water runes must be dissolved cumulatively to deal damage; once fulfilled, the enemy resets the number instead of attacking when its CD reaches 0. Every turn, Water rune positions will be burned and the runes converted into Fire runes. Burning positions cut 20% total HP when touched. Resists all controlling skills. Second life: Skill 2971. In the first round, the enemy raids and cuts 99% of your current HP (damage reducing and increasing effects apply). For 3 turns, your ATK becomes 0. 50% of your HP is deducted when the enemy attacks (ignoring damage reduction); the more attacks taken, the more HP deducted. Resists all controlling skills. Active (CD6): For 1 turn, this card cannot attack and damage received -60%. Next round, all runes have 150% Water effect. Team skill: When the team contains Water Roger and consists of only Water Humans, Water Roger's HP 2x. The initial forms of this series can be fed with 3* Werewolves before evolving them. Leader: When the team contains only Beasts, Team ATK 4.5x. When 6+ Light runes are dissolved, Team ATK 1.8x further. Active (CD6): Explode columns under Beasts to produce enchanted runes. For 1 round, if Light and Dark runes are dissolved, this card launches 1 Light chaser attack. If this active is the first active used in the turn, CD -3 at end of turn. Leader: When the team contains only Beasts, Team ATK 4.5x. When 6+ Fire runes are dissolved, Team ATK 1.8x further. Active (CD8): Convert 3 random runes to Fire (Heart has priority). For 1 turn, Self ATK 8x (cannot be shared). If this active is the last active used in the turn, CD -3 at end of turn. Leader: When the team contains only Beasts, Team ATK 3x. Beast ATK on Machinas 2x further. Active (CD6): Unlock the active skills of all Beasts and Machinas. 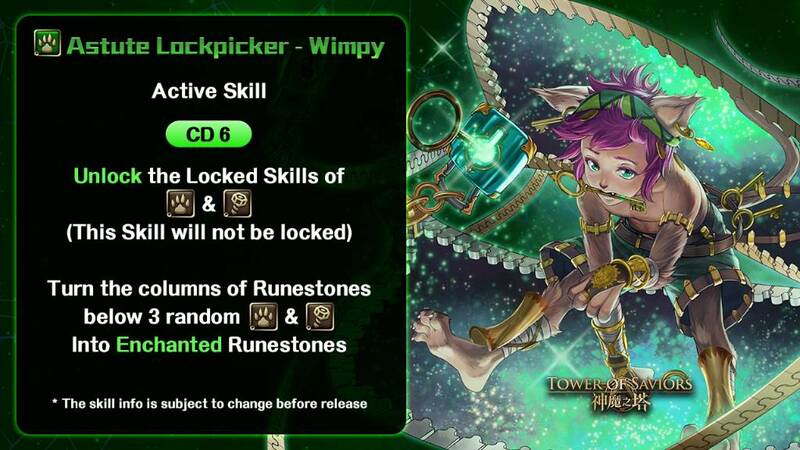 This skill will not be locked. Enchant the rows under 3 random Beasts/Machinas. Sorbek, Khepri and Serqet are three of the bosses here. The actives of the five common Cat Thieves: Plumpy, Copperfield, Wimpy, Choux and Tim. Suposedly they are Ali Baba gang, this are beasts and he is a demon though. My bet is that Elemental Calculation can't be activated with Drop of Daybreak Dew nor Stream of Sweepind Darkness - EX (Lynx and Lepus skills), will also probably break with a 15 combo Ghroth active. 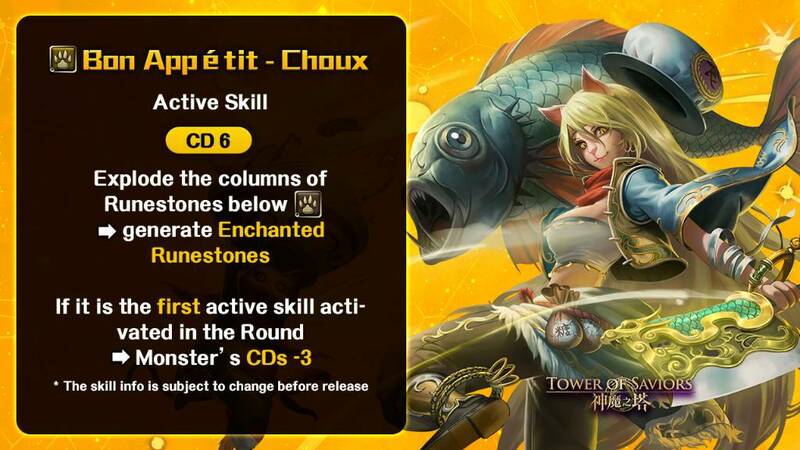 At cd 3 Croux active is pretty valuable, sure it might not be the best if you have a lot of attack runes but a full board eanchanted (mono beast team) plus all the benefits of exploding runes is great. Beast unlock is nice to have, too bad it isn't fire or light though. I wonder if one of the rares will be a machina-beast leader because the only other machina beast leaders are the machina schemas. CD 5 8x self attack is good and other than using time tunnels there's no reason not to use it last, beasts don't have a time tunnel yet so remember to always use the active last. I don't think having a [strike]paw[/strike]hand bigger than your head is good. Active wise, two turns full heal is usefull and the extra boost can be nice, if it's two turns of 2.5x that would be great. 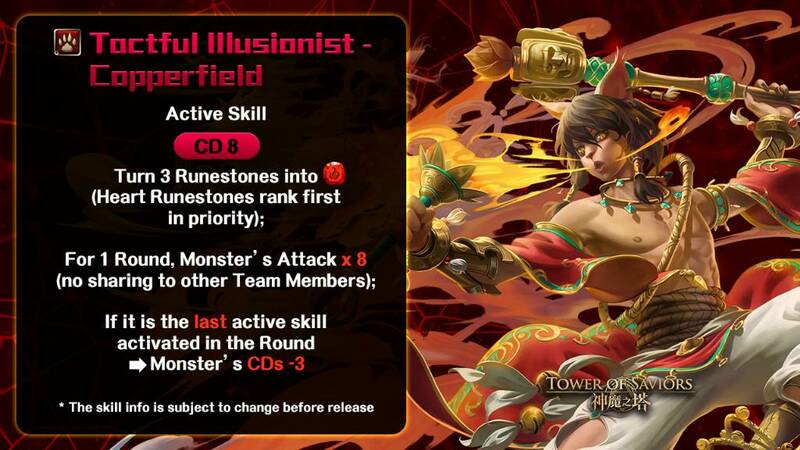 Leader: Beast HP and REC 1.5x. +2s spin time. Combo ATK bonus +125%. All attributes have the effect of other attributes; 20% for each Beast, up to 100% (can stack). When used as leader: For each 6* Cat Thief in the team, Beast Initial CDs -1, up to -5. The first 6 runes touched while spinning become Enchanted Beast runes. Active (cd8): 10 second time tunnel. For 1 turn, if Leader and Ally are Beasts, Team ATK 2.5x. If 5 attributes are dissolved, damage received this turn will not kill you. Leader: When the team contains only Beasts, Team HP 2x and ATK 5.5x. Deduct 10% of total HP every turn. For each Beast rune dissolved, recover 5% total HP. When used as Leader: For each 6* Cat Thief in the team, convert 2 Attribute runes into Enchanted Beast runes at the end of each turn (Earth has priority), up to 10 runes. Active (CD10): Turn all runes into Enchanted Beast runes. If the team contains only Beasts, then for 1 turn, initial dissolve can occur in groups of 1. Leader: When the team contains only Beasts, Team ATK 4x and REC +400. If the team contains no repeated members, then the more groups of runes dissolved, the more Team ATK increases further, up to 3x with 10 groups. When used as leader with Zero or Ghostie as ally, Beast HP, ATK and REC 1.3x and +2s spin time. Active (CD8): Can only be activated when all enemies' HP is full. All members enter Stealth and Team ATK 3x. Lasts until damage is dealt to enemies (CD will not cool down while this effect is active). Saruman VR becomes available at 4pm November 16 (Friday). Leader: Elf ATK and REC 3.5x. When HP is full, Elf ATK 1.5x further. Team skill: When Refined Saruman is leader and ally with four 4* Gnomes as members, members' HP, ATK and REC 10x. Active 1 (CD8): For 2 turns, Dark and Elf ATK and REC 2x. Active 2 (CD8): Fully recover HP. If the team contains only Elves, the first damage received this turn will not kill you. 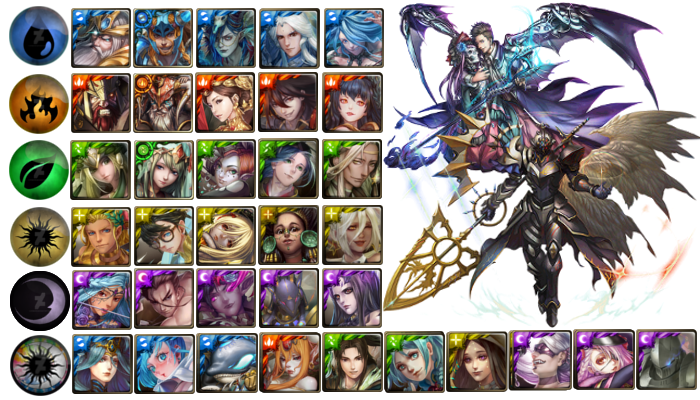 Leader: Dark and Elf ATK 4.5x. When Elf runes are dissolved, Dark and Elf ATK 1.5x further. Active 1 (CD6): Convert columns under 2 random Elves into Elf runes. For 1 turn, the more Elf runes dissolved, the more Team ATK increases, up to 3x with 25 Elf runes. Active 2 (CD8): Switch to Diverged Saruman Stage 2. Convert all runes into Elf runes. Active 1 (EP3): Convert 3 random runes into Enchanted Dark (Heart has priority). If the team contains only Gods and Elves, convert 6 runes instead. Active 2 (EP8): Switch to Diverged Saruman Stage 3. Convert all runes into Elf runes. If the team contains VR Loki (either form), convert Heart runes into Enchanted Dark. Active 2 (EP10): For 3 rounds, Heart rune drop rate becomes 0 and is transferred to Dark runes instead; all Dark runes dropped will be Enchanted Dark. The more Dark runes in the initial dissolve, the higher God and Elf ATK, up to 3.5x with 25 initial Dark runes. New Horror stage, Hydra. Usual Horror stage rewards apply. Leader: Dragon ATK 3x. If more than 3 groups of Water runes are dissolved, Dragon ATK 3x further. Active (CD6): Convert 9 random runes into Enchanted Water (Fire has priority). For 1 turn, if all Water runes are cleared in the initial dissolve, this card launches 9 Water chaser attacks. Next version's Arena card is Cullina. Active (CD7): Enchant all non-Enchanted runes. For 1 turn, the more runes enchanted, the more Team ATK increases, up to 2.8x with 30 runes enchanted. Next version will introduce a new VR Material, which can be used as a VR Material for any card that's not an Ultimate Lord or Sealed Lord. One will be given as the 14 day login reward of the patch (between November 16 to January 2). Leader: When the team contains 3+ Attributes, Beast ATK 5x. Active (CD 5): Explode the columns under this card, a random Fire Beast and a random Earth Beast. For 1 turn, if 6+ Beast runes are dissolved, Beast ATK 2.2x. Active 1 (CD8): For 2 turns, Dark and Elf ATK 2x. Recovery boost still exists, I think it is a mistranslation. Refined Saruman has 3.5x Elf ATK and REC, are you talking about Divergent Saruman? Because that form is more Dark-focused. Edit: Oh, never mind, you were talking about the active. Fixed. Tim (Dark Common) active drops runes clumped together, only generates until the first drop batch is filled, and prioritizes Dark > Light > Earth > Fire > Water. Is it just me or are collabs this year good and anything else is mediocre? If so I might skip this one or maybe just get the light one for Daoloth. Which rare is best?